The siren song of resort living is irresistible at The Palmtree Two. Here, the soothing rhythms of the everyday eclipse the clamor of the metro. Three residential clusters rise 10 stories above Newport Boulevard, Newport City's main avenue. A streamlined facade gives your community a contemporary edge. The surrounding landscape, dotted with palm trees, captivates you. Disconnecting you from your worries. And leaving you with a deep sense of calm. 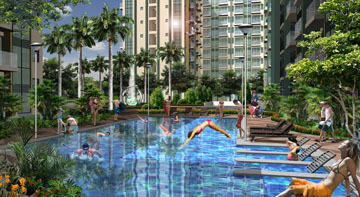 An ensemble of recreational amenities at the ground level sparks your desire to play. To set your fun side free. Keep fit while staying cool at the pool with in-water lounge. And if friends come over, the trellised pavilion by the pool is perfect for grilling and alfresco dining.